We loved tasting our way through the menu. 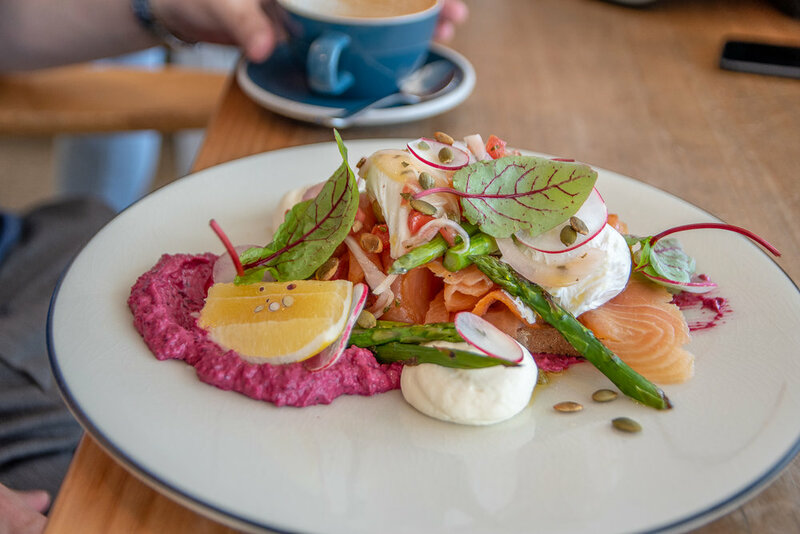 The dish of smoked salmon was a colourful amalgamation of smoked salmon, crème fraiche, sauce vierge, asparagus, beetroot hummus, sprouts radish and topped with poached eggs encasing dripping yolk – all sitting atop crusty rye. For the health conscious (and everyone else, really), the quinoa salad is a real winner. We loved this generous plate of nutrient dense ingredients. Think roasted sweet potato, quinoa, crispy kale, spinach, almonds and hummus all brought together by a light French dressing. It was truly a thing of beauty. For sweet tooths, do not go past the Violet Crumble Crepe. It’s a little fancy and a whole lot of yum. We loved the honeycomb crepe filled with airy chocolate mousse served with luscious ice cream, fresh honeycomb and chocolate floss. Located in Cheltenham, Frank’s is truly a lovely local café that is perfect for enjoying a lazy weekend.